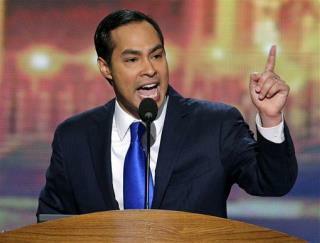 (Newser) – San Antonio mayor and rising Democratic star Julian Castro commandeered the podium tonight to extol the American success story of immigrants—who get just a little help. "Texas may be the one place where people actually still have bootstraps—and we expect folks to pull themselves up by them. But we also recognize there are some things we can't do alone," Castro told a wildly enthusiastic crowd at the Democratic National Convention. But Mitt Romney "doesn't get it," he added, pointing to the candidate's recent entrepreneurial advice to Ohio State students at a campaign stop. "'Start a business,' Romney said. But how? 'Borrow money, if you have to, from your parents,' he told them. Gee—why didn't I think of that?'" laughed Castro. Clear choice of paths: tax breaks and deregulation a' la George W. Bush, or Middle Class relief and fairness.